Playing a game of Gnomeball with the Gnomes is a great way to work off some steam. It's an Activity that's somewhat like Soccer, and it can be played in the Gnomeball Field located in the northwest corner of the Tree Gnome Stronghold. But remember: even though Gnomes are much smaller than you, that doesn't necessarily mean that they aren't aggressive players! To begin playing a game of Gnomeball, speak to the Gnomeball Referee near the Gnomeball Field. 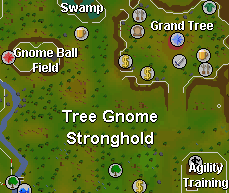 The field can be found in the northwest corner of the Tree Gnome Stronghold, which is northwest of Ardougne. The Referee will toss you the Gnomeball and you can now start playing! The object of the game is actually quite simple. Once you have the Gnomeball you have to run across the field to the other side to try and score, but there is just 1 problem. There's a multitude of Gnomeball players that are going to try and stop you by stomping on your feet and taking 2 damage. What's even worse is that they may even take the Gnomeball away from you! Although this sounds bad, you can still tackle the Gnomes on the other team to stun them for several seconds, or to get the ball back. You can pass to the gnomes on your team as well, and they'll even pass it back to you! You need to throw the Gnomeball into the goal on the other side of the field. Dodge the Gnomes that are trying to take the ball away from you. In the top corner of the game screen, you'll find the current score for the game. Scoring a goal adds a point to it, and you'll get some Ranged and Agility experience. You need to score 5 goals to win and leave with the Gnomeball. It's also important to note that you can't bring weapons or other items that you can hold in your hands (such as Flowers or Books) into the Gnomeball Game Field. Also, you can't log out during a Gnomeball Game, or in the field. Pass - allows you to pass to your Gnome team mates who are wearing green clothing. They will pass the Gnomeball back to you when you run by them. Tackle - gives you the ability to tackle a Gnome on the opposing team. If they have the ball, you'll get it back, and if they don't have it, they will be stunned. Shoot - choosing this option will cause you to shoot the ball at the goal. You need to run along the field towards your goal and attempt to shoot the ball into the goal. The Gnomeball players on the opposite team will try and stop you from scoring, and they may tackle you and take the ball. This will also cause damage to you. In order to get the ball back, you need to right-click on the player and choose the 'Tackle' option from the menu. This will make your character pick them up, take the Gnomeball, and then throw them on the ground. Very aggressive looking! This can get very annoying when they keep stealing the ball from you, but be calm-- you're not alone! You also have some Gnomeball Players on your team that will help you. On the field are some orange and red Gnomeballers, who are on the opposing team. The Gnomes in green are the ones on your team. You can pass to them while being chased by the other team. When you run past them, they'll pass it back. Now that you've gotten past the defenders, you can try and score a goal. There will be a basket-like net that you can click on to try and shoot the ball. Depending on your Ranging level, it may be more difficult (or easy) to get the ball into the net. When you score a goal, your Gnome Cheerleaders will dance around and cheer for you. After scoring a total of 5 goals, you'll receive a Gnomeball which can be taken out of the arena. This can be equipped and passed to your friends (and other players too) whenever you want. You'll also earn a total of 52 Ranging and Agility experience.